Browse: Home » 2016 » July » 28 » New Perspectives issue 1/2016 out now! We are delighted to present issue 01/2016 of New Perspectives – our subscribers have access to the full contents of the journal, which are listed and linked to below. 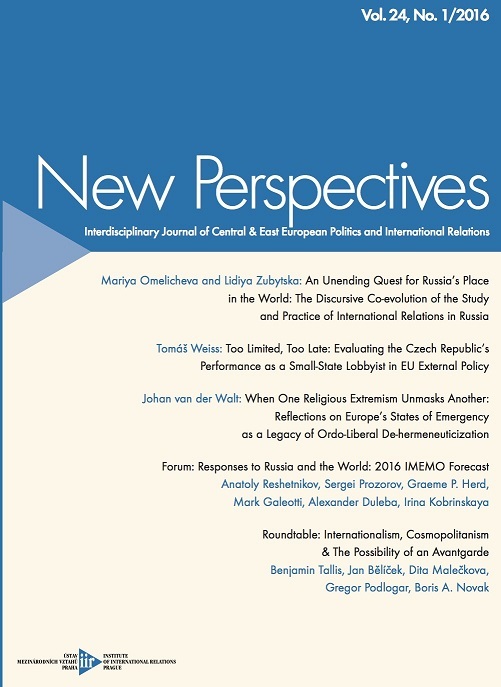 However, we are also very happy to be able to offer free access to the Editorial and to one of our original articles – or two if you sign up to our newsletter (email new perspectives@iir.cz for details). The Editorial seeks to provoke innovative responses to the issues that are raised by the widely recognised emergence of post-truth politics and argues that post-positivist scholars need to take more responsibility for fashioning progressive politics in post-truth conditions. Mariya Omelicheva’s and Lidiya Zubytska’s article explores the co-evolution of the theory and practice of Russian IR and its utility for understanding Russian foreign policy and international relations (download for free below). Johan van der Walt’ s intervention highlights the need to start to creatively re-interpret and re-imagine European politics, economics, societies and cultures in light of Islamic extremism but also of extremist European responses to it (email us and sign up to our newsletter to get a free copy). Those glimpses of New Perspectives are available for free but only our subscribers get access to the full issue, which further includes: Tomáš Weiss’ evaluation of the Czech Republic’s performance as a small-state lobbyist in EU external policy which sheds light on how states can influence Brussels – and how they can fail to do so; A fascinating Forum on the IMEMO Forecast 2016 – Russia and the World with contributions by Sergei Prozorov, Mark Galeotti, Graeme Herd, Alexander Duleba & Anatoly Reshetnikov; and a Roundtable discussion on Modernism, the International and the Possibility of an Avant-garde. Much has already been written and said about the UK’s Referendum on EU membership and on the vote in favour of Brexit. This editorial does not seek to rehash the many insightful analyses and heartfelt commentaries on these topics, but, rather, to highlight that from a progressive, post-positivist academic point of view, four key issues stand out. First, there is a need to engage with the kind of ‘post-truth’ politics that has emerged as a significant, anti-democratic and anti-progressive trend (see, e.g., Stokes, 2016; Viner, 2016). Second, progressive post-positivist academics are uniquely equipped to engage with post-truth politics, and we have a particular responsibility to do so – beyond as well as within academia. Third, progressive, post-positivist academics need to go beyond the safe, postmodern haven of critique and instead do more to inform and propose positive (although not positivist) and positional, rather than merely oppositional, alternatives. Fourth, in fashioning such new positive perspectives for the post-truth world, post-positivists can draw inspiration from modernist as well as postmodernist sources, notably from the avant-gardes of the 20th Century. This editorial elaborates on these points and link them to ongoing debates – in and beyond academia – some of which also feature in this issue of the journal. The purpose is to provoke innovative responses to, as well as reflections on, the issues that are raised by the widely recognised emergence of post-truth politics. However, any such responses will come in the context of the wider – and also widely recognised – challenges for progressive politics, of which Brexit and the campaigns that led to it are just the latest examples. As engaged post-positivist academics we have much to contribute to addressing these challenges, and in the post-truth world, we also have the tools to make such contributions. The idea of ‘Global IR’ generated a growing interest in ‘national schools’ of IR and their contribution to understanding the diversity of international relations. As a part of this discussion, the current study is set to explore what has been presented as Russian IR theory and its utility for understanding Russian foreign policy and international relations. Our contention is that there is still not a Russian ‘national school’ of IR with a distinct set of concepts and theories, research methods, and standards for assessing its legitimate contributions to global knowledge. Strongly influenced by the theoretical developments in the West, Russian IR has produced a number of conceptual innovations for the study of IR, but its highly ideological and relativist character limits its global appeal. The dominant Russian IR perspectives resonate with the world imagery and foreign policy agenda of the Kremlin administration not because they offer a novel and productive way of studying Russian foreign policy, but because Russian theoretical perspectives have been shaped, by and large, by political rather than academic considerations. To map out the complex theoretical landscape of Russian IR and how it relates to perspectives of Russian foreign policy-makers, this study employs discourse theory to analyse the co-evolution of the study and practice of Russian IR. It is quite possible that many Europeans – government officials, citizens and other residents of Europe – assess the massacres committed in Paris in January and November 2015 as criminal incidents whose prevention could have been achieved, as far as such a prevention is humanly possible, by more adequate policing. There are no conclusive grounds available for dismissing this assessment as spurious. Moreover, the relatively unproblematic public acceptance of the discourse of the state of emergency that slipped into the breach opened up by these awful events would seem to indicate widespread support for this assessment. There are, nevertheless, many other citizens and residents, with perhaps also some government officials among them, who do not find this assessment convincing. There is another wide-spread view in Europe that considers the assessment of acts of jihadist terrorism as mere instances of criminality as a grave over-simplification of the matter that contributes nothing to a deeper understanding of the socio-political problem that one is facing here. According to this view, the assessment of these acts “as acts of war by an enemy of the people” also contributes no significant insight in this regard, unless one is prepared to accept that France has spiralled into a civil war in which (some of) the people have become an enemy of (the rest of) the people. This Intervention article gives a voice to this other view. As will become clear, it draws much support for the position it takes from Giorgio Agamben’s assessment of the politics of suppressing crime through adequate policing as a politics that reacts only to the consequences of a deeper malaise without endeavouring to identify and resolve the causes of this malaise. Subscribe to our newsletter and get this article for free – email new perspectives@iir.cz to claim your free copy!